Despite its small stature, the Swedish Vallhund was originally bred to herd cattle. As secondary tasks it was used around farms as a property guard and for vermin control. The Swedish Vallhund is an ancient breed that originated in Sweden and was primarily kept in the Vastergotland region. Known as the Västgötaspets in their homeland, which translates to ‘Spitz Dog of the West Goths’ they were once also known as the Viking Dog because of their connection with the Vikings. Images of these dogs have been found on old Viking ships found in Ireland. Because of their similar appearance to Corgis it has been suggested that they are related. Corgi owners insist their dogs were pillaged from Wales by Viking raiders, while Vallhund owners believe it was the Vikings that took their dogs to Wales. Without actual evidence it seems that the argument will never be settled. 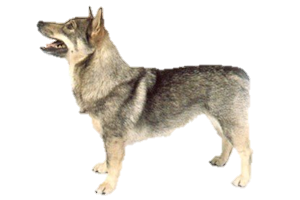 Nearly extinct by the 1930s the Swedish Vallhund was saved by a dedicated breeding program led by Count Bjorn von Rosen. Is the Swedish Vallhund Right for You?